You are currently browsing the tag archive for the ‘ME/CFS’ tag. End of February – where have two months gone? Well, it is the end of February. One sixth of the year has disappeared and it has happened pretty fast. I do know where it has gone, I have been working on my Disability Living Allowance form for most of this time, when I have been up to it. This form has taken over my life, along with appointments with all the medical professionals involved in my care to ask them to write supportive evidence for me in support of my application and also to talk to them about what is needed (as usually knowing about my medical conditions does not mean a doctor knows about how it affects me personally, which is what the benefits people need to know). Last time I got help from a charity as it was the first time I had applied and had little idea what was required. This did help a lot in terms of energy for filling in the form, though not the outcome. This time I have largely filled it out myself, which with my physical and mental stamina has meant it has taken me a very long time. My partner has helped me type some parts and has physically written up the form, as well as checking what I have written and suggesting things I have forgotten, and that help has been really helpful but she is so busy that I could not ask for more and frankly, I am the one who knows the most about it and how it needs to be done. She could have gained that knowledge but it just seemed above and beyond to ask her to do that on top of everything else she has on her plate. I know that my facebook friends and others are probably sick of hearing me talk about it as I have vented a little during the process and all will be relieved to hear that it will be sent off this week! Hurray! I cannot wait to see the back of it though I know that next time I hear anything it will be a request for a medical, which last time I found VERY traumatic and lead to the denial of my claim and I had to go to appeal. The whole process took a year. It was successful in the end, but I am really not looking forward to that all over again. It really takes over your life and energies and it was a hard year for me. I have filled this form in so thoroughly and carefully in the hope that it will go through and I can avoid that year of hell this time. I am crossing everything but I know that just about everyone with ME goes to appeal. Even my CFS specialist said so, so I should not get my hopes up. I know that so many people are going through benefits processes and appeals at the moment, the whole UK system is in a mess and people are being treated so unfairly. It is really inhumane. Anyway, two months of my available energies have been used up already and I really want to use what I have now for better and more creative things. I have several new arty books from Xmas that I want to look at for inspiration as well as projects I have been planning for months (actually years) that I want to get on with. I also have a lot of fiction/non-art books that I want to read – I love having a pile of books waiting but at the moment it seems a little too high and I keep dipping into new ones before finishing the ones I am on! I need to focus on the ones in hand and ignore the temptations of the bookshelf or I will not fully enjoy each one as I go as I will have half an eye on the next one – no way to be! One of the best things to happen so far this year was a couple of weeks ago I went to see The Imagined Village. I have seen them before and knew it would be good, but it exceeded my expectations (except it seemed to be over far too quickly) and it was a night to remember! I always love to see Eliza Carthy live, and they are all such talented and enthusiastic performers that it is a real joy to see people doing what they evidently love. There are more concerts planned by them and other related artists to raise money for Norma Waterson (Carthy) and family who is Eliza Carthy’s Mum and who is very ill in hospital. Details here. Other news, my sister is coming to visit me this week! I have not seen her for nearly two years and I am looking forward to some fun! Also my garden is coming back to life after all that snow in December and I am feeling a little hint of spring in the air… I hope to be able to get outside a bit more soon. Also interesting to note that though I don’t feel dramatically better, I feel that my condition is more stable in terms of energy at the moment. I do not seem to have much variation even after I have been to an appointment (or been to a concert!). I do still get post-exertional malaise, but it is not as severe as in the past (relative to my overall function levels) and I am finding I am getting more pain instead, if anything. This change is actually welcome. (I think one of the worst things whatever level of function is the unpredictable and ever-changing nature of this illness and not knowing what is ok to do and what the day will bring). I do rest more before and after an event and I am careful in what I choose to do and cannot go out often, but I feel it is not such a big risk to go out occasionally. I don’t mind taking more painkillers occasionally for a good reason. I think my wheelchair is helping me not have such a dramatic reaction to being out, and also perhaps my Alpha Stim and Acupuncture are helping me. I am sleeping better in general and I think this has a lot to do with it. My nerve pains are also more under control with the Gabapentin dose I am on and this of course helps a lot. Anyway, it is nice to have some calm and I hope it continues like this a while, especially if it means I can do some nice things at home and pop out a bit more. I could do with some fun, and I am sure I am not the only one! As I may have mentioned before, I got an Alpha Stim machine a couple of months ago. It has two functions: Pain relief and also another setting called Cranial Electrotherapy Stimulator (CES) which helps the brain go into an alpha state – relaxed yet alert! The pain relief part is done with electrodes like a TENS machine or with probes (pen-like shape). The current is much more gentle than a TENS machine. The probes work faster than the electrodes but are harder to use on yourself in hard-to-reach places! The CES setting is done via ear clips on the ear lobes. I have been using it on both settings just about every day since i bought it. The results have been positive, especially the CES setting. I did not think this part was the part that would benefit me the most, as I have a lot of pain issues and the CES setting is generally used for low mood and anxiety. It also helps with sleep. I have found that I am sleeping better, and that it often just makes me feel better in myself when I am having a low point in the day. The pain part is more complicated for me. In the information it says that some people have a delayed reaction to the effects of the Alpha Stim on their pain. This applies to people who find that they have a delayed effect with anaesthetics and, lucky me, I do. This means that I may not feel any change immediately, but may feel much better the next day. This does complicate things when trying to measure the effects of the machine, and also it is hard to know how much to do and whether to do it on the days when the previous day’s session has had a good effect, i.e. the pain is not really bad at all (but i know it will return)! For most people though, the effects are felt right away and so they know when to stop, and indeed, start. I have found that I have immediate benefit from the Alpha Stim with pain in my jaw and face and well as it getting rid of headaches sometimes. I have been having trigeminal neuralgia recently and it has been less effective with this type of head pain. I have been using it the most on my chronic upper back, shoulder and neck pain. I think there has been a definite improvement but I still feel the tension in the muscles, especially in my shoulders, and the pain does come back, especially after using those muscles. I think I need to experiment further with the machine, how much to do and when, etc etc. I am still getting the hang of it. Other pain that I have is neuropathic pain. The Alpha Stim does not claim to help this type of pain but I was hoping the CES setting might help with generalised pain issues and overall sensitivity to pain over time. No real change so far. I also have very tender skin which feels bruised to the touch on my legs (well all over, really). I think it could help with this type of pain but there are two issues: firstly to do my whole body would take half the day, literally, and secondly the probes use a conducting solution on the ends and that liquid triggers my nerve pain (as does all water/humidity) so I have not been treating my lower body very much. The company I bought it from are very friendly and helpful and I think I will be ringing them for more advice soon. I also want to talk to my acupuncturist about it, as he introduced me to it, but I have not been able to see him recently. I have an appointment next week though. So in summary, I would say that I am happy with my Alpha Stim, but it has taken some getting used to for me regarding the pain relief. It also needs the help of someone else to do my back well, which is not always very convenient, or else I have to use the electrodes which can take quite some time. The CES setting has been really beneficial and I enjoy using that part a lot. You can read about it here (this link is to the FAQ page as it is a quick intro but there is lots of other good stuff to read on other pages, like research studies etc). Yes, I have been to more medical appointments and have more on the horizon. Last week I saw my new GP for the second time and am pleased to report that she is still as good the second time around and I will be sticking with her. She was running very late though and we were there two hours in total so it was quite a struggle. I get the impression she always runs late as is the type of doctor who is more concerned with doing a good job than sticking rigidly to the time constraints imposed upon her. I don’t mind waiting really if I will get a good appointment where I will be listened to and taken seriously, though it is not great when you are unwell and it took some getting over. She did look quite frazzled though and my partner did comment that if she carries on doing such a good job she may get burn-out! I really hope not. Outcome of the appointment is that I am on a higher dose of Gabapentin for my nerve pain and have started Mebeverine for my IBS. I have not taken any drugs for my IBS for many years (just relying on dietary changes, as well as having tried lots of probiotics but with no real change) but after more than two years of a restricted diet it is still flaring up and painful there is no more I can do on that front, so thought I would try again with the drugs. About ten years ago I tried them all and had no improvement, but I think there is a slight improvement already after just three days this time! I need longer to really know but I think there is less pain at night-time and perhaps things are a bit calmer as I have not been playing it especially safe food-wise. The GP did suggest that I could try Amitryptaline at a low dose to help with IBS but to ask the POTS specialist if it’s ok. So this week I have been to see the POTS specialist. She says Amitryptaline not a great idea unless absolutely desperate as it can lower blood pressure and increase heart rate – two things I do not need. We also discussed the drug (Dilzem) that she started me on last visit. I think it has helped my stamina and also my recovery time after doing things, enough to be a trend but not in a really dramatic way. It is better than nothing. She did not change my medications this time, only the timing of one tablet and I will be wearing a blood pressure monitor for 24 hours soon to check how I am doing. Based on the results of that she will know if I can tolerate higher doses of drugs or not and adjust as required. I hope I will get to try higher doses as I know POTS symptoms are still affecting me daily and where would we go from here if not? I am not sure! So that is it, two pleasant appointments which makes a nice change. On a vaguely related note, my trigeminal neuralgia has been bad the last few days. Gabapentin is a listed treatment for this condition, though not the main reason I am taking it, but still it keeps flaring up. I am concerned, as reading about it, it seems that it is something that gets worse and worse over time and can become very bad. I wonder how bad it would be now if I was not taking Gabapentin? I am seeing the ME/CFS specialist in a few weeks and want to talk to him about my neuropathic pain in general and also the trigeminal neuralgia. I would like to understand how these conditions fit into my ME/CFS (if they do) and what I can expect long-term with them. They are quite concerning and debilitating on top of everything else. I also want to ask him about Low Dose Naltrexone (LDN). This is taken by some people with similar itch/nerve pains as me as well as people with ME/CFS so I think it might be worth trying. I hope he will be open to letting me try it without having to fight for it. I have just received an appointment for the Pain Clinic at my new GP surgery. It is for next week. I have already had an initial telephone call and also filled in an assessment form for them. The doctor I will be seeing seems very intelligent and not patronising and keen to help me understand my pain issues. He did talk a lot during our phone call about Fibromyalgia and pain sensitization (or something similar to that) which is good but I don’t think the whole picture. I do not have a Fibromyalgia diagnosis and may have to take some info with me about pain mechanisms and ME/CFS as they do seem to be distinct entities and there is often much pain in ME/CFS in it’s own right… At least he is willing to talk about biological processes though, and did not sound too much like he was just going to teach me breathing exercises. I doubt he will have much to say to help me understand the nerve pains though. It will be interesting. The appointment will be an hour long, which will be a challenge in itself. In the last few weeks I have noticed a gradual improvement in my stamina. I think there are a number of things that are potentially contributing to this improvement, which is great whatever the reason, though I would like to know what exactly is helping so that I can continue with it! About six weeks ago I went to see the POTS specialist and had a list as long as my arm of current and pressing issues – she (rightly) could not deal with them all and it was not a successful appointment (for that and other reasons) and it upset me, but I could not pick and choose between all these issues as I was just overwhelmed by various issues which were all severe. These included: Sleep, Neuropathy and Trigeminal Neuralgia, Muscular Pain and Tension as well as other pain issues, POTS (this was low down the list so you can see how bad the other stuff was! ), as well as medication issues. She gave me a new medication to try for POTS (Diltiazem). I did not start it for the first few days as other outcomes from the appointment were that I should stop taking my sleeping tablet (eszopiclone) to see how I am without it, and also I had only just increased my dosage of Gabapentin (for Neuropathy) over the previous few days, so I did not want to confuse things by doing it all at once. Also around this time I was having massages of my back, neck shoulders and head which were pretty intensive as the pain and tension there was really getting unbearable. My head felt so tight and painful and my scalp was really tender to touch in places (always is a bit, but was getting very bad and more widespread). My neck felt very painful and weak and was clicking in a very disturbing way low down my cervical spine. Shoulders and upper back, well, the usual. A couple of days after the third massage I felt the tension really lifted and I no longer was taking painkillers every single day. The clicking was also much less frequent – I think the muscles were not clamped so tight around the joints. This was also the time that I started taking the Diltiazem, but I did not think it would do anything and apart from the pain/tension improvement I did not feel any different. A few days later I had my first acupuncture appointment. It was another couple of weeks before I had the second appointment and did the Tai Chi (and “broke” my back). Then another week until the third, when I started to use the Alpha Stim (see previous post). During the last few weeks I have noticed a gradual increase in what I can do in the day. I am certainly more active, particularly mentally. I am also sleeping much better and dreaming vividly all the time! I have taken the sleeping tablet again briefly when my mum was here and it confirmed what I thought. It does help me get to sleep but once it wears off in the early hours I feel more awake than I would have done without it. Very odd. As it is I am sleeping much more deeply than I have for a long time with no drugs at all. I am still getting up several times for the toilet but am just getting back into bed and back to sleep easily. I am also sleeping deeply most days and later in the day than I was. It is working for me despite being bad in theory to sleep late in the day (sleep hygiene blah blah). I think the higher dose of Gabapentin is helping to control my nerve related pain and discomfort which used to flare up every time I got out of bed (or in!). It is still there but milder and as long as the bedding is smooth and flat underneath me (a constant battle) it is usually ok. I think with me Gabapentin takes a few weeks to reach it’s maximum efficacy. When I first took it, although there was some improvement it was not for a few weeks that it really felt more consistent, and the same has happened with the higher dosage. I think perhaps the added activity is also helping the sleep. I am being careful not to overdo it, though some days it is hard to stop pottering about with little things, as they all add up. I have at times got that “wired” feeling of having over-stimulated myself, but I am also recovering more quickly. I have had the odd bad day but overall it’s a very positive trend. I even went out into town (being pushed in wheelchair). We went to three shops one evening and I did practically all my Christmas shopping. Then we went for an Indian meal before returning home! It was really great to have a meal out and I felt pretty good throughout. I hate department stores (it was only them that opened late) but I did not get over-hot and being in the wheelchair made it much better for obvious reasons (like being able to go fifty times further!) but also in terms of navigation, which I am rubbish at in shops. It is so nice to allow someone much better at it than me to push me around: she knows where the lifts are, where the exits are, how to best get from one shop to another etc. So much more relaxing! I also find the decision-making hard but as the shop was not too busy or noisy and I had a list of people to buy for, I just stayed calm and focussed and got through it in no time. Such a relief and great to avoid lots of deliveries coming to the door at random times when I am in bed in the day. The most amazing thing – yes I am getting there, waffle waffle – was the payback… or should I say LACK OF PAYBACK!!! I rested the following days, but was still pottering around more than I felt I should following such a big trip out. Day three I really felt it would hit, but it didn’t really. This is unheard of in my world. I was only saying to someone more moderately affected than me a few days before that unlike her, I am rarely surprised by how ill I feel, as it is predictable: do something slightly more than usual, second day, bam – feel awful. I take a few more days to rest, then carry on with the usual routines. Even my IBS did not flare up too much after the meal out, which again, it usually does even if I am careful about what I eat. So I was on cloud nine about that. It really made me feel that the improvements are solid, even if I have not felt quite so strong since then. I feel an upward trend again at last. I am kind of hoping that most of the improvement is down to the new POTS drug. It has been about a year since I felt any real improvement in function from Midodrine, the other drug I take for POTS, which has plateaued really, despite some dosage increase. I also tried Ivabradine which I was not sure about in terms of improvement as I had such severe neuropathy at the time I was in a lot of pain and not sleeping well at all, so I could not tell. I could not get a prescription for that in the end anyway. I have, in recent weeks, been to have acupuncture three times. It has been a really positive experience so far. I had been to see this acupuncturist before, several years ago, when I had paralysis of my eyebrow and forehead on one side as well as trigeminal neuralgia in the same area. He sorted that very easily last time so when I had a return of the trigeminal neuralgia I knew who to call. Thankfully the trigeminal neuralgia seems to have eased off again for now, but he is going to try to help me with pain and muscular tension in my back, shoulders neck and head. We then may move onto other issues such as neuropathy or IBS/bladder issues, we shall see! There are always more symptoms to try to work on, after all. It is early days and he is having to try things he has not done before as he does not think my body can tolerate a more standard approach. I already feel better but it’s early days and I think some of that is perhaps due to seeing someone who is trying so hard to help me and who really wants to see me improve. I am interested to see how things progress and what he can do to help me. He has given me some “On-chair Tai Chi” exercises to do (handy video so I don’t have to remember it) as I told him how I just don’t seem to get any benefit from traditional stretching but that I want to find a way to help my muscles unlock their tension. When I try to hold a stretch (even a gentle one, not at full extension) I experience muscle trembles and feelings of fatigue before I have held it long enough to be effective. Also I get twitches afterwards when I use certain muscles. He explained that the gentle, circular and flowing movements of Tai Chi might be of more benefit. I think getting things moving in any way is great. I also like the “stillness through movement” idea of Tai Chi – it’s like meditation. The first week he gave the exercises to me I felt I could not do them at all. I did them a couple of times to get the hang of them (it’s a very short video, just a couple of minutes of movement) and my back (already hurting) went into major pain and I had a day of alternating ice and heat packs on it, followed by several days before it eased back to “normal” levels. It felt like my back was broken between my shoulder blades! I also doubted that I could sit upright to do them as this can be a challenge on its own (without the addition of arm movements). I usually sit on a big supportive chair that goes up to head level. The exercise needs to be more upright and with space for arms to move. He also let me borrow a machine called the Alpha Stim 100. It is classed as a TENS machine, but the current is much different (less) and it can do much more (if what they claim is true!). I used it for three and a half days and could already feel a good improvement in my back pain, particular the part that felt broken the week before and was still sore. This pain all but disappeared. Pain all around and above my shoulder blades and neck were also improved, though still present at least some of the time. The machine has the pain setting and also a setting which is directly acting on the brain waves. I found this to be really pleasant and effective. It lifted my mood and feeling of wellbeing immediately. After using the machine for a few days I found I could do the Tai Chi much more easily. The Alpha Stim machine died on day 4 (it was old! ), so I could not continue with my trial of its long term efficacy, but I have continued to do the Tai Chi daily. I am also meditating daily to keep up my alpha state, but it is a lot harder than with the machine! I am very tempted to buy one but they are expensive and my trial was a little short! There has been quite a lot of research done on people with Fibromyalgia with positive results. Details of research done and how it works are on the website ﻿. I am missing it… I am going to talk to my acupuncturist about it. I was planning on writing a thorough review of the book How To Be Sick by Toni Bernhard, but I am taking advice and guidance from Michael Nobbs in his new ebook Sustainable Creativity and I am keeping my tasks simple and manageable. If I write a short review I can get it done today and have a sense of achievement, rather than not finding the energy for days/weeks and having the task hanging over me. He also encourages us to not care if something is not perfect, allowing us to get on with our day. This review will not be well honed but I hope it will be good enough. I am not even going upstairs to find the book to refresh my memory before I start! In How To Be Sick, Toni combines the experiences and challenges that chronically ill people face day-to-day with Buddhist teachings in a very effective and seemingly effortless way. It does not feel like the chronic life is being forced to fit into a paradigm, it is as if these two things were meant to be thought about together. I found that I did resist buying this book, despite the good reviews. As someone with very longstanding ME/CFS I have become wary of self-help advice. Often it is forced onto us, inappropriate, claiming to cure, patronising, making assumptions about us and so on. Or we seek it out ourselves and get “self-help fatigue” on top of the illness itself as we work so hard to challenge ourselves, examine ourselves and change ourselves and just end up twisted in knots feeling no better, calmer, stronger or healthier. We then feel a failure and I for one no longer take part in these activities. I suspect I am not alone. Who, when chronically ill, has the energy to keep constantly looking at themselves in such an intense manner? So against this backdrop, Toni has bravely approached the problem in a new way. It really does feel so refreshing and when I actually picked up the book and started reading I felt no resistance. It is written in an easy to understand, absorbing, humourous way (I laughed out loud at a bit about Sarah Palin!). Most importantly she takes us on her personal journey and explains how difficult she still finds some of the practices, rather than saying she has reached some level of perfection (enlightenment!) and therefore effortlessly copes with all day-to-day stresses and restrictions on her freedom. Of course she doesn’t, she is only human, and that approach allows us all to have a go, Buddhist or not. I have occasionally done Mindfulness of Breathing meditations over the years, in phases. I first started before I became ill when a monk came onto campus once a week when I was at university to do a guided meditation. I found very powerful and energising at the time. While it is harder to do in a body which is constantly uncomfortable and without your own monk to guide you (! ), I have found that being guided by a recording is also good. The book made me see this practice in a new way and I feel encouraged to keep doing it and getting more and more from it. What really felt encouraging for me was that although I had not heard of many of the Buddhist ideas in the book, I found that I could relate to the practices. I realised I have been doing some of them by myself. For example, I do enjoy the joy of others more than I perhaps did at the start of my illness, even when I cannot participate in the source of that joy (although there are some people with which this is easier to do, than with others who make no acknowledgement of your own situation! I still have work to be done.). It is nice to feel that you have made some progress yourself inadvertently just by living with illness so long. I have upped my dose of Gabapentin, which I am taking for nerve pains. These are mostly occurring on my lower legs, but also affect thighs, arms and other places on occasion. I have recently (re) developed Trigeminal Neuralgia despite being on this drug, which is listed as one which helps. I had it about four years ago, in conjunction with forehead paralysis which meant one eyebrow did not rise (!) though it felt like it was doing so… a bit odd. This time my eyebrow is thankfully mobile but the nerve pains, while not severe, are quite persistent and annoying. I cannot lie on one side of my face much which limits the already limited positions I can lie in in bed due to other pain. I have stopped taking Eszopiclone, a sleeping tablet. I am stopping for a month on doctor’s advice to evaluate how I am without it as I have been taking it for several weeks with mixed results. I have had two stern warnings from GPs about the risks of addiction and they say it is usually only prescribed for a two-week period. Well, I have not experienced any issues with stopping it which is a relief and good to know. I think I will just take it when I am having stressful times or when I have things planned that I need to be functional for, like holidays/Christmas or visitors. It has helped me to sleep in some ways. I was getting to sleep earlier on it, getting up for the toilet only about 2-3 times as opposed to many more previously. I was still waking in the early hours and sometimes having trouble getting back to sleep, though it was perhaps easier than it is without sleep medication which was less stressful. The real issue for me was that I did not feel much better in myself in the daytime for supposedly getting more sleep. Why pollute my body and risk addiction/withdrawal in that case? I will see how things go. It is useful to have something to fall back on if things get really difficult for short periods. I have also started Diltiazem for my POTS symptoms. It is a calcium channel blocker, though I do not know much about it. It is listed as a drug that can make Orthostatic Intolerance worse (!) but I am only on day two and it’s too early to say either way if it will help me. I also asked the specialist at the hospital about my increasing pain levels and painkillers, as I am taking more and more these days, though still being fairly restrained. She says to focus on paracetamol and she suggested going to a Pain Management Clinic. I don’t know what they will be able to help me with, but I am willing to give it a chance. The most exciting thing for me today is that I have just made an appointment with an Acupuncture practitioner. I saw him when I previously had Trigeminal Neuralgia and he sorted that and made my frozen eyebrow move again as normal in just 5 sessions. It moved a tiny bit more each time! After my disappointing appointment with the specialist earlier in the week I am looking forward to his calming, attentive and holistic approach to my health. He is very well-regarded and very skilled as well as quite a character! I really enjoyed seeing him before and hope he will have a healing and de-stressing effect on me. I primarily would like him to focus on my trigeminal neuralgia and headaches/tension in neck & shoulders as I think they are all connected. I hope he will be able to help with neuropathy and other pains too. He also used to try to help me with temperature fluctuations and I think there is plenty for him to tackle in the long run but that perhaps it may be worth taking a set of symptoms at a time as it is easier to track progress that way. I will see what he thinks. I have had a few massages recently as the pain and tension in my head, neck and back has been getting really bad. I have avoided them due to my nerve pain for a long time – just lying on my front was impossible even in soft clothes but better now that I am taking Gabapentin. I still would not be able to have a full-body massage (do NOT touch my legs!) but my back is possible. I have tolerated the massages pretty well and they have helped, but only in a very temporary way. I hope the acupuncture will be a little more long-lasting in effect. I went on holiday a couple of weeks ago, and overall it was great! I was a little anxious about it beforehand as so many symptoms threatened to put a damper on it. Also I was feeling quite low in mood and really wanted it to be good – that kind of need is a dangerous thing. My and my partner went on holiday, with our dog, but also a friend joined us half way through and stayed with us a week so we had some time with her on holiday and then at home as well, which extended the holiday vibe – so a good ten-day holiday for us. 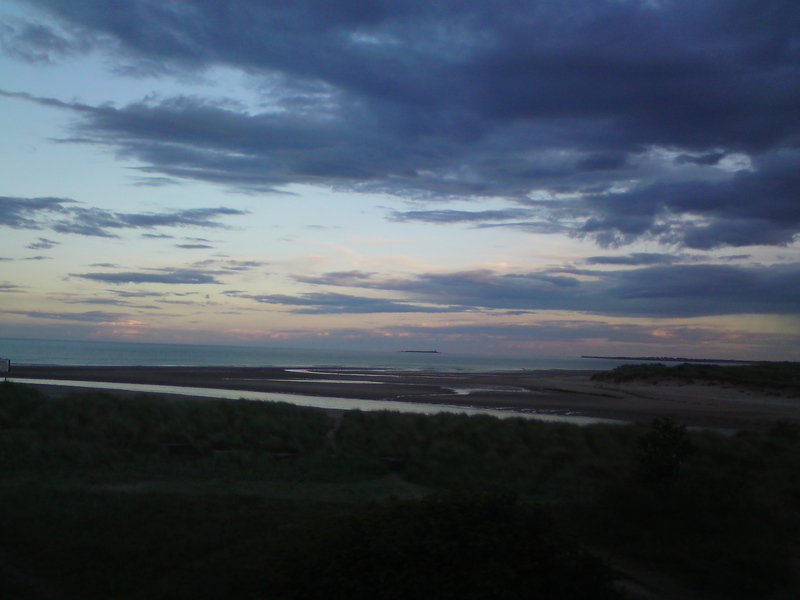 We rented a cottage on the coast, actually very close to home, as travelling is something I struggle with and a long journey would have been something I would have to recover from once I arrived. Plus, if things were really bad, we also had the option of coming home again easily. It was lucky in the end that we did that as between booking and going I got my wheelchair. On the way home (because our friend had joined us mid-week) my partner had to make two trips as our little car was unable to take all our stuff, plus wheelchair, dog and three people. The cottage was “bijou” – small and beautiful. It had a cabin-like feel with long painted boards on the ceiling and several times after being pushed in the wheelchair (which makes me feel pretty spaced out), or just when feeling a bit unsteady in general, I really felt like I was on the ocean wave without my sea-legs. There was a nautical theme with lighthouses, driftwood and shells aplenty and it was lovely and felt very “holiday”. The beds were pretty comfortable. I was very worried about that before we went and had even rung them up to ask about them, after the very bad bed experience on our last holiday the winter before last. I did have a lot of nerve pain while i was away, both in bed and just randomly in the day which was quite draining and disruptive but I did sleep pretty well as I have started to take Eszopiclone and I think it really helped me to sleep in the different surroundings and with the nerve pain, which certainly allowed me to do a few nice things while away. We travelled up on the Saturday, but did not leave home until 3pm as the cottage was not available until 4pm. This worked quite well as I usually am not up to much until then and need a midday nap anyway. We got there and had a quiet evening but we did go along the road to find a view overlooking the sea before we settled down for the night. You have to see the sea, right? (It was not this late when we went that first day, but this is the same view). The village streets were far from wheelchair friendly and I had to get out a few times when we went about (not to mention the time when I flew through the air and landed on my feet when the wheelchair came to a very abrupt stop in a big hole between some cobbles… I am a human cannonball… I was fine but my partner developed a huge bruise where her foot had hit the tilt bar at the back – ouch!). On the Sunday it was really sunny and lovely so we went for a wheelchair walk, first along the river, which was the perfect width of path and really easy (except for the massive steps at the end), then down to the beach. This was not very easy as it was a steep hill and we didn’t properly think through the return journey (what with our sense of adventure and holiday excitement!). The beach was lovely and warm. We (well not me, to be honest) dragged the wheelchair down the beach with us so that we could get to the water without leaving it miles away. I threw caution to the wind and decided to paddle. My nerve pain is worst at my ankles and is triggered by water and temperature change so it was a bit risky, but basically I just tip-toed so they didn’t get too wet. It was lovely and warm and frankly I would have just gone for a swim if I could have. Lots of people were and it was packed. After a sit down, it was decided that my partner would take the wheelchair back up the beach and go along the car park and I would walk along the beach to the next path and meet her there. The car park was large gravel and like one big pot-hole so she could not push me along there, so I had to walk and so I might as well enjoy the beach. We hoped the other path would be less steep that the one we came down. 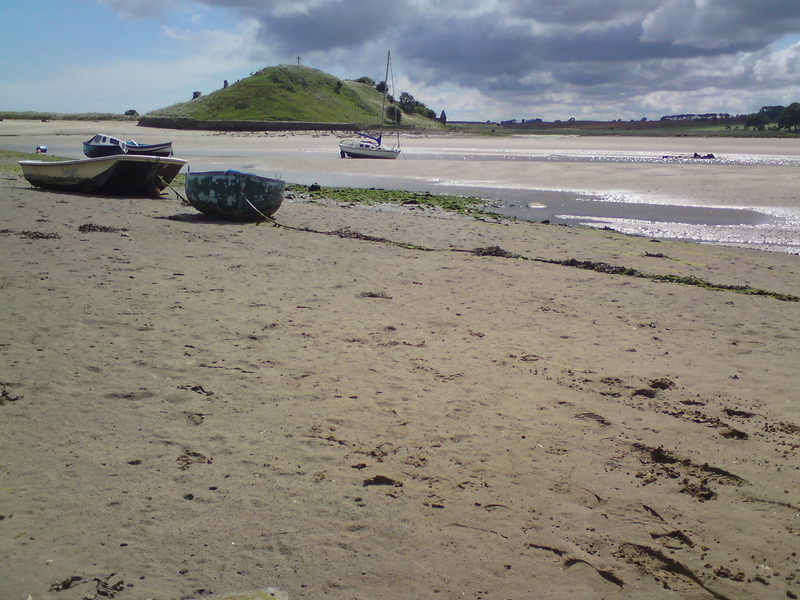 The sand was very soft and although I enjoyed the walk it felt much much longer than it looked and it was hard going. I found some nice shells and all was sparkly and beautiful, but by the time I got back to my chair I felt quite awful, weak and POTS-like. I sat a while to get my breath back and let things calm down before I then had to walk more (huge gravel then steep hill!). I managed but it was way too much. On the way back to the cottage we sat in pub beer garden for a quick drink and it was sunny and quiet and I was comfortable sitting in wheelchair and felt ok. I really needed the “tonic” part of my tonic water! By the time we got back to the cottage though I had completely crashed. Just lay on sofa in zombie mode for some time. We were out for several hours but the time just flew by and we both had a really nice time being out exploring together so it was worth it. After that I had a couple of quiet days resting and recovering (with a lot of nerve pain), and our friend arrived the Tuesday evening and we went out to the Indian restaurant around the corner, which was really good. I was really careful about what i chose and basically just ate rice with a little bit of the different dishes to taste – it paid off as I had no IBS flare-up afterwards! Amazing! The noise really got to me in there though, and after I finished eating all I could do was sit with eyes closed as I could not even follow the conversation with all the other noises there. We could not stay long. I felt better once we left and got some fresh air. The Diary of a Dying Man by William Soutar – (This is available on Amazon, I have not chosen that link, but it’s easy to find). I have read the first few pages and I think this will be a really interesting book. It is witty and also has already come up with some parallels with my life; early on he discusses various things people tell him will do him good (pills, potions, foods) and he says that he would be taking things constantly if he listened to all of this advice. I know that feeling! Longshore Drift by Katrina Porteous and with Linocuts by James Dodds – this is the first book I really focussed on when I went in. It was on a little display and I cannot believe that no-one else had grabbed it before I got there. A little gleaming gem. The poem is very interesting but it is the linocut prints that have had me reaching for the book several times while away and also since I got home. They are just amazing and there is always something new to see. As I have tried to do stamp carving (I don’t know what to call it really), I can see how he has chosen which parts to cut to make the black image/lines and it is interesting to observe his techniques and choices. The detail is amazing; as is how simple lines can do so much. Southern Mail/Night Flight by Antoine de Saint Exupery – I have only read Le Petit Prince before, but this is described as poetic and it sounded interesting, though I have never really been interested in flying… But if birds do it, then it may be something I can get into! The Memoirs of a Survivor by Doris Lessing. This, she says, is part autobiography; but it seems from the description to be a kind of dystopian novel and by far the most frightening-sounding book I have chosen! She is someone I have heard of in terms of her feminist and political views, but I have never read anything she wrote before, so I will see how it goes. That evening I stayed in resting while they went to pub for a while. It was nice to have much-needed quiet time but when I got lonely they came back for a chat before I went to bed, which was really nice. The next day, Thursday, the sun was out again so after eating breakfast outside on our tiny bit of decking, I walked down the hill (funny little path through people’s back gardens) with my friend and we went to explore the estuary. We took pictures of boats and I tried to do a little sketching but it was not really the best circumstances as it was a bit on the parky side with the cool breeze and also not very comfortable/relaxing to sit. Sand was too wet/squidgy so we sat on a concrete block for a while. Had to walk a little way up a hill (very slowly!) then rang my partner to come get me with wheelchair. We stopped for a cuppa in tea shop on way home. I had a big sleep then we watched DVD of The Girl With The Dragon Tatoo, which I really enjoyed. I was the only one who had not read the book, but they said it was a good film version of the original. Friday I felt pretty rubbish. We tried to go to the pub and play cards in the afternoon but it was too noisy – first a large group of middle-aged women squawking and screeching in hilarity at each other, then when they left another gang of younger people who all laughed really loudly together in great bursts. I felt a bit sad that I can’t enjoy being in groups like that anymore. I could not focus on my cards while that was going on, and it was really uncomfortable for me, so we had to leave. We played a game later in the cottage, but I was still not feeling too hot. Saturday we had to get up early to leave by ten. My partner had already been home and back again by then with the first load. We actually left at 9.30! I tried to rest once home but my body/brain had obviously become fairly confused by it all and gone into emergency mode. In the afternoon and evening I felt hyper and weird and could not rest, adrenaline taken over and although I knew it was not real energy and I tried not to do too much, I did unpack and tidy up a bit as I knew I wouldn’t be able once it all caught up with me and it is nice to get sorted. The next couple of days I was in bed until mid afternoon both days and not feeling great but we managed to have some gentle chats, watch a bit of TV and have half a game of scrabble before my friend left early on Tuesday morning. So it was a mixed bag, but with some really nice experiences. I would have like to have been able to go to the beach a bit more but the inaccessibility mixed with the torrential rain at times (I forgot to mention that!) meant it did not happen. We could not drive around the village much as the parking was so tight we could not move the car much at all, which is the only reason I would not stay in that actual cottage again. Since the holiday I have been feeling generally pretty awful much of the time, and my cognitive function has been very low for me which has been a surprise really. I wonder how much is due to the new sleeping tablets I am taking. I am going to have to experiment with them. Writing this has taken f-o-r-e-v-e-r!!! I have however been out a couple of times since being home again, just taking advantage of the fact that my partner has been around a bit more and also not wanting to waste any last sunny days before the end of summer, which feels somehow imminent and over much too quickly. We went into town with the wheelchair, which made it the most pleasant trip to shops I have had in years; it really helped and I bought a few things while I had the opportunity to try things on – it was actually fun! Also we went to a local lighthouse to enjoy a sunny afternoon and just sat and enjoyed watching the waves and feeling the warmth. A gentle but lovely trip out. I finished my camera films off at the lighthouse so I am sending my holiday snaps off to be developed soon! I did not take as many as I would have liked, but I hope there will still be some nice ones there. Or should I say ME/CFS/FM Awareness Day, as this year I want to talk about Fibromyalgia… even though I do not have this condition. I suspect that those of us who do not have Fibromyalgia, even if we do have ME/CFS/CFIDS do not really know what exactly it is. I know a couple of people (not that well, admittedly) who have Fibromyalgia, and still had only a vague idea of what it involved. My basic understanding went as far as “ME with more pain” and “warmer climates help”… Recently i have been having more intense and different (for me) pain and have suspected that i may be developing some Fibro-like symptoms, so decided to look into it further. *Please note* I have not been diagnosed with Fibromyalgia, nor am i any kind of expert on the subject, but i will try to link to information that will help to explain it better than i can. I have conducted two interviews with people who have Fibromyalgia, I will link to them at the end of the post. Are ME/CFS and FM basically the same illness? I recently read online about research/theories of Central Sensitivity Syndromes (CSS). These are a collection of conditions which are linked by problems with the Central Nervous System and this leads to what they call “central sensitization”. The conditions which are considered under this umbrella are Fibromyalgia and Chronic Fatigue Syndrome, among many others which we will recognise and often suffer from in tandem, such as Irritable Bowel Syndrome, Temporomandibular Disorders, Tension Headaches, Multiple Chemical Sensitivity, and several others. I find this interesting and heartening that people are looking not only at biological/neurological factors for these illnesses but also the links between them. What continually frustrates me is when i get something new and it is treated in complete isolation to my existing conditions, when, to me it seems obvious there are connections to be made, not only in understanding them, but also potential in treating them. Click here to read the articles I refer to, start on page 12). So, what are the differences between them? FM is identified by 18 distinct tender points (designated points on the body that are painful when pressure is applied), while CFS/ME is distinguished by post-exertional malaise (deep fatigue and exhaustion following physical exertion, which lasts more than 24 hours). Exercise: One major difference (from ME/CFS) I have found when reading about FM is that exercise is recommended and is helpful in pain management and taking in some control over pain symptoms. I have recently read “Fibromyalgia: Simple Relief Through Movement” by Stacie L. Bigelow (2000, John Wiley & Sons, Inc) as I was looking to find some simple stretches that are designed in a way that I could do them, and which might help me to manage some of my pain and muscular tension. She explains the thing I had heard about FM before; that it is a sleep disorder. In my recent internet searches I have not found it referred to in that way so much, and I wonder if it is an outdated view to characterise sleep problems as the root cause of the condition, rather than the Central Nervous System (I don’t know, I am speculating). However, from what she says, it does seem that much of the pain is caused by the lack of restorative sleep; that people with FM do not get into a certain phase of sleep which is when the body heals itself and repairs damage to tissue. She explains that when we use our muscles, they are damaged and this is the normal process which leads to strengthening: We use a muscle and when it repairs itself it prepares itself for being used again by repairing itself stronger than it was before, which is how we build muscle mass and strength. In FM the sleep is disturbed, and is not sufficient to repair the muscles as quickly as someone without FM, leading to greater pain after activity and often an avoidance of further activity, leading the muscles to seize up. A cycle of pain develops. Even though i do not have an FM diagnosis, I think that some of these processes are going on for me. I got very motivated to do movement and activity when I read the book, and even started to entertain the idea of actual exercise! Then I remembered which body I was in and that I have ME and POTS, not FM, and it was just not going to be possible to take it that far. But I do think moving as much as we can within our limits has to be good. I sometimes think my weak bladder and the fact that I live in a house with stairs (though we do have a downstairs toilet, thankfully!) must be keeping me in a better state than if I was just sitting/lying completely still all day, rather than getting up fairly often to go to the toilet. It is not much, but it is something. I wonder how people who have both FM and ME/CFS manage to balance the pain and the pacing, it must be harder to decide when to move and when to rest when you have both. Interestingly I have recently been taking a new night-time medication and the result is much better sleep and my muscular pain is much, much better. I really did not think my sleep was that bad (I was certainly getting enough hours) but it seems it was not good quality, despite all my efforts of sleep hygiene etc. I will certainly be paying much more attention to this link in future and talking to doctors if this medication ceases to work for sleep in future. Two people I know with Fibromyalgia have kindly answered my interview questions, click here to see their answers. If you would like my copy of Fibromyalgia: Simple Relief Through Movement, as mentioned above please leave a comment below and I will pick the winner at random (i may even use a hat!) at the end of May and contact you to arrange to post it to you. Please check back here at start of June to see who is the winner, just in case i cannot get your email from your comment! I have found that the book is not really suitable for me as someone with the severity of ME that i have, but i will be copying the gentle stretches before i pass it on, as they do look possible. If you have FM and can manage your sleep to enable you to gradually tolerate more activity in your life, it is a motivating and sensible book written by someone with FM. 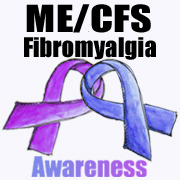 To read what other’s are blogging about for International ME/CFS/FM Awareness DAy 2010 click here! Please note, this post contains some moaning but it does end on a fairly positive note!! It seems that i started to take the progesterone pill almost 2 years ago (it will be two years at the end of June, see post from the time). I have just had my blood lipids checked for the second time, and while i was there i found out more about the results from the test i had last June. I was told at the time that my cholesterol was “a bit high” but at 5.2 or 5.4 (i have forgotten exactly) it did not seem too bad. Today i found out the actual problem is that my HDL cholesterol is actually too low (0.8 where it should be over 1.1 for a woman). I apologise for not knowing what these measurements mean or are measurements of, that was not discussed with me. Only i was told it is the difference between the two amounts which is bad, rather than just a case of one being dramatically too high as i was initially told. The HDL kind that i am low in is the one that protects from heart disease, so it does not sound too good. I will have an appointment with the doctor soon as the new test results have come to discuss if things have changed and what it all means. The reason i am being tested is that being on the type of pill i am on (it is not the same as the progesterone mini-pill, it is slightly different, and works to stop my periods completely) can affect my lipids profile. Progestins do that apparently. I am not sure if they ever tested my lipids before i was on the pill to make it clearer whether this imbalance is directly due to the pill, or actually due to my illness in general. Apparently low HDL can be associated with certain conditions. I wonder if ME is one of them, especially seeing as i have read (somewhere) that heart-related deaths are higher amongst us, not that i want to scaremonger without evidence! Anyway i will get my results in a few days and see if anything had changed/improved this year. If not i may have to stop taking the pill – not an attractive prospect with everything else i am dealing with at the moment. I do want to try to find some answers, even if i don’t really want to take more drugs as things just seem constantly a struggle, the itch has really got me down and just feels like the last straw on top of all the other symptoms i have. It affects my sleep and rest in the day, creates a stress reaction which is very physical and draining and it has really been getting me down. How can i manage my basic condition when i have all this discomfort? I am certainly not getting out of the house much and my quality of life feels almost as low as it has ever been, though i find this hard to measure. I really have been feeling the last year that although the Midodrine has helped to control my POTS symptoms to some extent; they are still present, progress has plateaued and other things have come in to take their place to disable me. The years just pass and so many ongoing symptoms do not seem to be addressed; like my back problems which i have had from day one, literally. I cannot believe that a) there is nothing that could help and b) that spinal health will not affect my overall health, particularly as many problems i have a neurological and the spine is pretty important in carrying messages etc from the brain… This is a subject for another post, and i start to ramble – just needed a little rant!! I had three visitors last week (one, then a couple) and it was a full on social week for me with three evenings (had a break in between) with talking and catching up. It felt quite strange in a way and i have lost some confidence in face-to-face social interaction (except with family etc) but i really enjoyed it, coped pretty well energy-wise and felt ok to interact most of the time (and i want more! I resisted the urge to chain them up and keep them here). I did have a major crushingly tight headache which lasted about 3 days solid and other flare-ups as a result of the exertion, but i feel it was worth it for the pleasant distraction from my woes and a great break from the usual routine. I certainly can’t visit anyone else at the moment, so i may try to encourage people to come to me, though it is always a gamble and a certain amount of stress/pressure. Well, we are all accustomed to the “no pain, no gain” way of life, eh?